A stylish bedside table can instantly infuse your bedroom with a dose of elegance and functionality. It serves as a convenient place for keeping several essentials such as your phone, charger, hairbrush etc. always at hand. However, since bedside tables are quite convenient when it comes to providing storage space, they often become the go-to spot for storing even things you don’t use on a dality basic and don’t need them so close by. 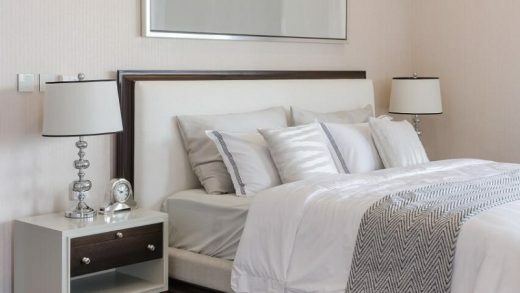 This is how cluttered nightstands are created and in my opinion, they simply lose their aesthetic appeal, which in turn may affect the bedroom design as a whole. Every element in your personal oasis for relaxation should reflect positive energy that would in turn help replenish your energy, and that goes for your nightstand as well. With a bit of creativity and keen eye for organization, you can keep your bedside table clutter-free and turn it into a chic focal point of your design scheme. First, it’s essential to get rid of any items that do not belong on the bedside table and organize them properly in the drawers. This way you can make room for some décor magic to take place. Once you have clean and clutter-free nightstand, it’s time for some decorating fun. Here are some décor ideas and tips that will hopefully give you some inspiration and help you give your entire bedroom a more put together look. The décor rule less is more especially applies when decorating bedside tables. With a few simple, yet chic items you can easily make your bedside table stand out. Stylish, yet practical elements such as mantle clocks are ideal for this purpose. They feature a unique design and are available in a variety of colours and materials, so you can easily find one that best compliments your interior design. To add a rustic flare to the space, consider getting wooden mantle clocks, which are timeless and classic. If you’re on the look for something more modern, then a digital mantle clock might be the perfect solution for you. The right colour pallet can have a major influence on the final look of your bedside table. This doesn’t mean that you only have to choose items of the same colour. While white picture frames combined with a white clock might seem like a great idea, the final result might bore your eyes to death. Make sure the colours compliment your bedding and furniture, while adding interest and a nice contrast to the overall design scheme. Purple and beige, red and white, grey and yellow are just some of the colour combos that work great together. No bedside arrangement can be considered complete without functional and chic lighting that can set a pleasant and relaxing ambience. A modern lamp in a unique shape can add more dimension and it can certainly look great paired with a colourful vase of aromatic flowers. If you’re after something a bit more decorative, consider getting pendant lights or scones that you can hang above your nightstand. This way you’ll get more free space for placing other bedtime essentials, all while giving your bedroom a wonderful glow.